As Kingston is still home to a military base, it is probably no surprise that the city contributed greatly to Canada’s World War II efforts. In the Inner Harbour, A. Davis & Son tannery supplied much of the leather for combat boots, giving material meaning to the now shop-worn phrase “boots on the ground.” The Hield Brothers Woollen Mill produced cloth for army and air force uniforms and blankets. Swamp Warders who worked for Alcan made aluminum for airplanes and those who worked at Canadian Locomotive made armaments and munitions. 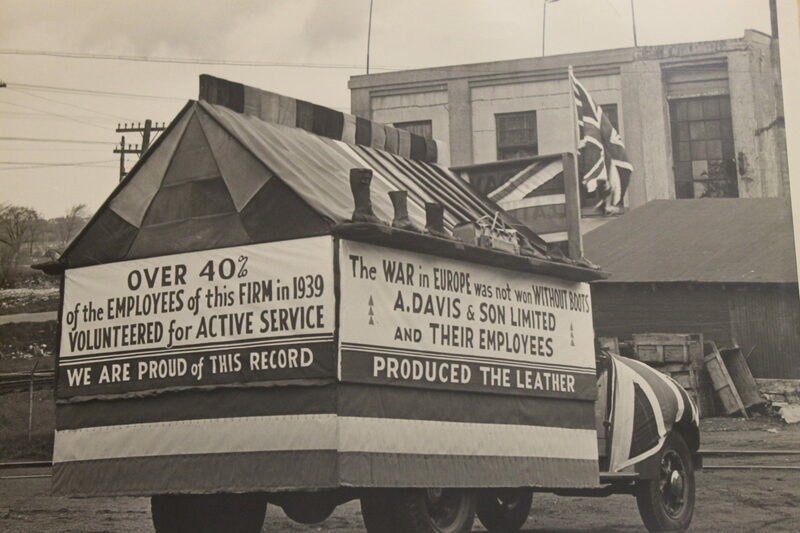 Promotional posters on A. Davis & Son truck outside the tannery, 1945. Courtesy of the Queen’s University Archives. But the Swamp Ward’s contributions went beyond its industrial products. As this photo claims, over 40% of the employees at Davis Tannery volunteered for active service and presumably other businesses in the Inner Harbour experienced similar numbers. The wartime city directories give us a glimpse of how the Swamp Ward and Inner Harbour neighbourhoods changed when husbands, fathers, and sons left Kingston for war in Europe. James Street, like all streets throughout Kingston and Canada during this time, was emptied of ‘fit and able’ men of fighting age. Their occupations listed as “active service,” men like Thomas Hollywood and his neighbour Wallace L. Lemon, both of 21 James Street, or George Grant, Leslie Robertson, and Arthur Hartwick, all neighbours in the apartments at 117 James, stand for many of those who left Kingston to fight for “King and Country.” Young Ernest Timms, also of the apartments at 117 James, left behind his parents and six siblings. Unlike his other comrades from 117, he was unmarried. Other James Street men on “active service” in 1942-43 include William Stewart of 118; James Smith of 125; Romeo Clement of 129; John McBurnie of 134; John W. Peters of 142; William Wooffinden of 143; and Thomas Doolan of 145. What the directories don’t tell us, at least not explicitly, is what these men’s wives did in order to run their households while the husbands were overseas. Did they get jobs at the Woollen Mill, which employed hundreds of local women and was booming during the war? Did they find jobs at other industrial or commercial businesses in the area or downtown? And what about the women whose husbands never returned? Swamp Ward children were also affected by the war. Mrs. Lillian G. Maddigan lived at 119 James Street with five-year-old Barry Maddigan and two other children, James and Herbert Anderson, aged eleven and ten. James and Herbert went to the public school while Barry attended the separate school. Barry’s guardian is listed as Michael Maddigan. Was Lillian Michael’s mother and she was thus caring for her grandson? James and Herbert’s father, Boyd Anderson, was on active duty and presumably had left his children in Mrs. Maddigan’s care. There is a similar arrangement just down the street: Edwin and Mary McGlynn, at 129 James, were caring for Ruth, Alexander, Emmet, and Frank Ferguson, aged 15, 14, 9, and 6. The children’s guardian, Emmett R. Ferguson, a driller at the Vimy Barracks, was presumably also on active service and had left his children with trusted friends or relations. And what happened to these people after the war? I found a few of them in the 1948 directories. Wallace L. Lemon moved to Princess Street and became a parts manager at J W Palmer Motors. Leslie Robertson moved to Barriefield and worked as a cleaner and helper for the Department of National Defence. John McBurney continued living on James Street and became a carpenter at RMC. John W. Peters also returned to James Street and got a job as a machinist at Aluminum Co. What happened to the others? Perhaps they found employment in other cities and left Kingston with their families. Or maybe they never came back.